Drones are now just a fact of life. People don’t even blink or turn to look when a fat old DJI Phantom huffs and puffs overhead to take yet another aerial photo of the neighbour’s zen garden. Yet despite the now mainstream quadcopter drone being a staple of daily life, there are still plenty of people pushing the limit of drone design. Sometimes it’s for a serious research and development goal and sometimes it’s just because they can. 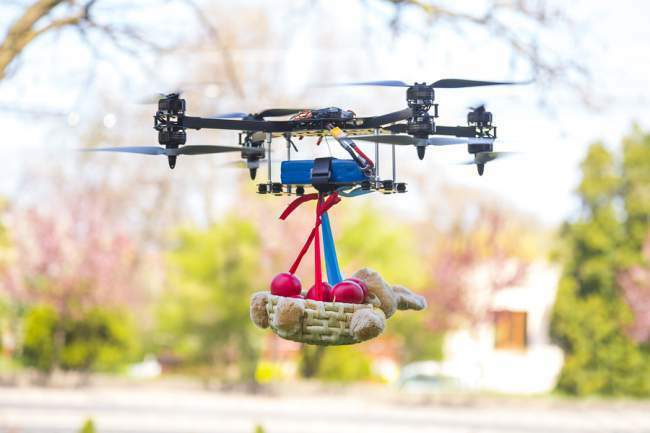 In this article we’ll be celebrating the mad scientists of the drone world. The guys and girls who just can’t stop messing with something that ain’t broke. Each of these flying machines has something about them that’s either at the extreme end of its class or just plain weird. No matter why they make this list, no one can deny that they’re freaking interesting as hell. Drone racing always puts me in mind of the pod race in Star Wars Episode 1: The Phantom Menace. The rest of the movie may be divisive, but just about everyone agrees that these high-speed pods were pretty awesome. When I see the FPV footage from drone races the breakneck speed feels almost too fast for a human to deal with, yet these talented pilots have the reflexes of a cat hopped up on speed. That feeling of speed is however mainly the effect of scale speed. In absolute terms these racing drones top out at about 80 miles per hour. Not exactly slow, but not much faster than say the average Toyota. Now imagine taking that mind-bending speed and more than doubling it. That’s exactly what they’ve done with the DRL RacerX, which managed a Guinness World Record-breaking speed of 163.5 miles an hour. It’s top speed is actually 178.78 miles per hour, but the official speed is an average of three runs. As usual, I’m sure someone in the comments will disagree with a claim such as “smallest” anything. Either by the time you read this there will be something smaller or it will just turn out that there was some more obscure that I simply missed. Either way, you can’t deny that the Aerix VIDIUS HD is positively tiny. The whole thing measures in at 4.3 x 4.3 x 2.5 centimeters, yet it’s packing a 720p camera and FPV transmitter. Just stick your phone in a VR case and you too could be exploring the world like you’ve been shrunk down into a tiny ship. You know, like Fantastic Voyage or Honey, I Shrunk the Kids. For such a dinky little drone it’s actually got some decent specs and features too. It has an altitude sensor, blade guards and even some tricks like a one-touch takeoff. While the Aerix is both tiny and HD, no one thinks that the camera footage from it is great. The GoPro series of action cameras have been essential to getting great footage from drones that don’t have enough lift capacity to drag anything more substantial skyward. So what’s the smallest camera that can lift a GoPro? Not anything you can buy off the shelf. Which is why a crazy guy named Robert McIntosh decided to try and shrink down a GoPro platform himself. He achieved this by stripping the GoPro down as much as possible to reduce its weight. The whole, ready-to-fly drone weighs in at only 120 grams. That’s just two grams shy of what the GoPro itself weighs before the modifications. How small is this GoPro drone? The entire craft is only five inches wide. This is the drone build that inspired me to write this article in the first place. The crazy idiots from my favourite YouTube channel FliteTest took it upon themselves to take the racing drone design and scale it up into a frankly ridiculous size. Just look at that picture. I wouldn’t be surprised if the diagonal size exceeded the average human arm span. After quite a bit of trial and error this giant drone flies pretty well and produced quite a lot of shock and awe. Powering this monstrosity are two 26 000 mAh batteries. It uses a new generation of powerful electric motors to make it all possible. It might have been done as a bit of a joke, but seriously this is actually a really cool drone. I’m mesmerized by it’s slow, ominous turns and the low hum of those massive blades. It’s just, like, beautiful man. I’m a guy that likes military science fiction and the first time I laid eyes on this Hummingbird II from Reference Technologies it just tickled the part of my brain which likes a good techno-dystopia. The Hummingbird II is mean-looking, carbon-fiber covered flying machine that is actually meant for all sorts of applications. The top-end EX model has a 32” central ducted fan, which seems to provide the main thrust. It then has eight rotors that help it to maneuver. There are however a couple of models. Cheaper ones have only six external rotors and a 24” central ducted fan. The Hummingbird drones are hybrid-electric machines that can fly in excess of six hours while carrying payloads in excess of 20 pounds. Ultimately the company plans to size this UAV up to allow for a bigger payload and eight-hour flight time. It has hardpoints all around the body where equipment such as surveillance cameras can be mounted. I really like how the central ducted fan also cools the motor, which is mounted directly beneath it. This is the sort of craft I imagined when drones first started going mainstream, instead to be disappointed with 30 minute flight times and no lift capacity. To put things in perspective, the first-gen Hummingbird has a 300-400 mile range. Holy moley. The RADEUS is what a flying machine as imagined by people from the 60s might have looked like. It’s a saucer-shaped machine centered within two counter-rotating blades. The blades spin at 60 miles per hour and since they move in opposite directions they also function as an anti-torque mechanism. The same way that a quadcopter’s opposing rotors cancel the torque from each other out. I can’t find anything about this concept drone on the Radeus Labs website, only the photos taken at the relevant drone expo are on the web. Yet I’ll always remember this as the coolest-looking contra-rotating drones I’ve seen. As a consolation prize here’s a video showcasing how the contra-rotating design actually works in flight. Look I don’t think I’m alone in absolutely adoring the Back to the Future trilogy. I’m looking at a replica of the flying DeLorean from the second film right now. It’s here on my desk. I’m that attached to this series. In the movie Doc Brown, a literal mad scientist, builds a time machine from a DeLorean. By the second film he’s taken hover technology from the future and retrofitted it to the car, so that it can fly. As Doc Brown says “Roads? Where we’re going we won’t need roads”. So I guess that it would be inevitable until some tried their hand at building a replica of that DeLorean using drone technology. By now there have been more than a few tries at this, but the one that first blew me away was this 2012 build by YouTuber Native18. In his build log video he shows how he took some foam panels and shaped them into a great replica of the iconic car. Yes, up close it doesn’t really stand up, but in flight and especially at night it made my little geek heart flutter. I’m almost willing to declare it the greatest night-flyer drone of all time. I’m not sure if the ALTA 8 is really the most expensive drone you can buy, but I sure couldn’t find anything with a bigger price tag. We also can’t count drones that cost more, but aren’t for sale. I’m talking about commercial multi-rotor machines. So why exactly does the ALTA 8 cost so much? Well, the spec-sheet is pretty eye-opening in that regard. It has eight motors, each capable of producing a continuous 350W of power and a peak of 950W. It has a maximum payload of 9.1 KG or 20 pounds. That’s a third more than a Matrice 600 can handle. Apart from this, the ALTA is built and tested to to an insane degree. Do you think DJI does a test-flight on every Phantom before boxing it up? Well FreeFly does it for every single ALTA 8 before shipping it to the customer. This thing is (metaphorically) bulletproof. It has weather resistance, whereas your typical drone deals with mildly inclement weather by remaining in its box. With the largest batteries equipped this puppy will carry it’s max payload for 15 minutes or a 1-pound payload for nearly 35 minutes. I could talk all day about the ALTA, but there’s other drone-tastic things we need to cover so go check it out for yourself. Pushing the limits of drones is about more than just building drones to expand those horizons. Sometimes it’s about thinking up new stuff that drones can do, things the typical (sane) person would never have come up with. Like, attaching stuff to a drone and then seeing if it works. Hey, it might sound like a hillbilly joke waiting for a punchline, but when it works, boy does it work. Let’s start with a pretty obvious one: guns. We’ve seen flying drones toting small arms in films, TV shows and video games, but in real life it’s not that simple. The missiles fired from military drones are guided in various ways, but to accurately fire an unguided ballistic projectile from a flying platform is no joke. Then there’s the recoil to deal with and a million other things. It sure sounds like it would take some work from a team of professional engineers. Or you could just be a kid goofing around in the woods. OK, we have time for one more. What’s even scarier than either a gun or a flamethrower? Answer: a chainsaw. Lots of people think that the Finnish guys who put up a video of their drone complete with working chainsaw attached is fake. Well if it is fake both I and the Verge have been fooled. Personally I choose to believe that the chainsaw drone is the real thing. How majestic it isn’t. How un-elegantly it destroys snowmen.